For this past week’s class, the main objective was to learn and gain as much hands-on experience from the 3D Printing Expo. 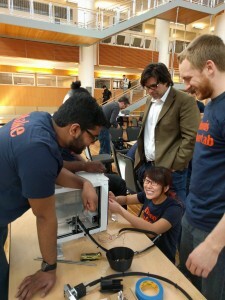 To accomplish this objective, students chose to partake in certain sessions of the event. Specifically, these sessions were assembling a 3D printer from the Ultimaker kit, upgrading the Ultimaker 2 to the Ultimaker 2+, and scanning of individuals’ heads to be 3D printed. 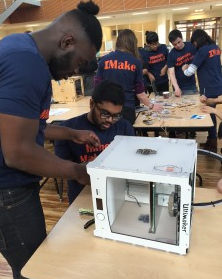 Students, along with the help of an Ultimaker representative, had to work together in order to complete these tasks. 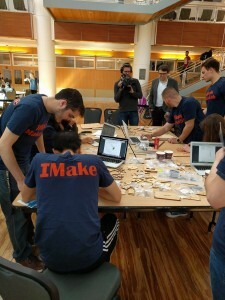 By the end of the event, students gained a variety of skills from the workshop such as team building and critical thinking. Although the 3D printer wasn’t fully assembled from the kit, the Ultimaker 2 from the Illinois MakerLab was fully upgraded to the Ultimaker 2+. 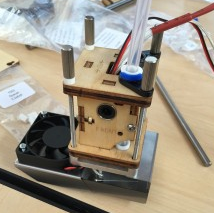 As for the scanning session, there wasn’t a completed 3D printed object in the time allotted for the event. The reason as to why these two sessions were left incomplete is simply because they require a lot more time. All in all, students worked really hard during the event and thoroughly enjoyed it. Check out some of the stills from this past week’s event below! Clearly, the students were engrossed in completing their tasks. Here are some quotes from students in regards to the event! 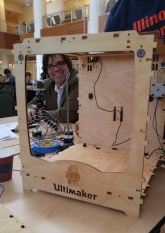 Week #9 – Ultimaker 2 Upgrade! This entry was posted in Week9 by Joshua Mathew. Bookmark the permalink. Awesome pictures Josh! I forgot to take a final look at the frame before we had begun cleaning up so thank you for posting! I agree, I think overall the event was very successful and did a great job publicizing the course!